Indonesia’s economy is on the cusp of expansion and stability as it scales a GDP growth of nearly 5.3% in the second quarter of the year, up by 4.15% from the previous quarter, and 5.19% from the same quarter a year ago. It is against this backdrop that the Indonesian International Plastics, Processing, Packaging and Printing Exhibition INDOPLAS, INDOPACK (incorporating INDOPROCESS) and INDOPRINT will be held from 19-22 September 2018 at JI Expo, Jakarta. PricewaterhouseCoopers (PWC) in its 2015 report, The World in 2050, forecast that by 2030, Indonesia’s GDP (at PPP) will cross US$12.2 trillion, following the US; and outpacing Japan, UK, Germany and its other ASEAN peers. By 2050, Indonesia would join the so-called E7 or the seven largest emerging market economies, along with China, India, Brazil, Russia, Mexico and Turkey. Hinging on the economic growth, the growing population, which will cross the 261 million mark, and expanding middle class, Indonesia is projected to account for almost 40% of ASEAN’s growth by 2030; with 90 million Indonesians to account for an ample share of the consuming class over this period, according to a report by McKinsey & Company. The country posted retail sales growth of 4.1% year-onyear in April, according to a Bank Indonesia survey, which attributed the development to increased sales in food and beverage (F&B), automotive fuels, and other consumer goods. This augurs well for the growth of the Indonesian plastics market, forecast to witness a CAGR of 6.23% in a Mordor Intelligence report spanning 2018 to 2023. Polyolefins and engineering plastics would vet larger shares in the market during the forecast period, it said. Packaging will be dominating the market in terms of applications, hoisted by the F&B industry, to be used in a range of applications including bottles, cups, pots, trays, and many others. An emerging trend of busy, fast-paced lifestyles in Indonesia’s flourishing urbanisation are driving the demand for smaller, convenient, on-the-go packs, and other packaging types, according to a Global Data market report, Trends and Opportunities in the Indonesian Packaging Industry, which also alludes to rising environment awareness among consumers as a key factor in thriving demand for ecofriendly packaging formats. Flexible packaging holds a broad usage in the food industry, accounting for almost two-thirds market share in 2016. Owing to its low cost, flexibility to suit multiple shapes and sizes, convenience, and low-carbon foot print compared to rigid plastics, flexible packaging is forecast to grow at a CAGR of 4.3% during 2016-2021. Rigid packaging, likewise, has snapped up a sizeable market share in applications in the soft drinks and food industries. As a cost-effective solution to keep packaged food fresh longer and to provide ample protection for products during transit from plant to market, rigid plastics are gaining favours among manufacturers. Lightweight and innovation-driven, rigid plastics accounted for packaging market share of nearly 25% in 2016, to grow at a CAGR of 7.7% to 2021. Thus, as demand for packaging solutions in the Indonesian market is escalating, US extrusion machinery firm Davis-Standard is ready to serve with equipment designed for complex structures, energy efficiency and operational longevity. Davis-Standard’s solutions are for Indonesian converters who seek materials versatility as well as new processes to create unique products. These solutions also address the regulatory push to improve energy consumption and minimise material usage with the end goal of improved sustainability and source preservation. An example of this technology is Davis-Standard’s dsX flex-pack 300S. This single-station extrusion and lamination line is specifically engineered for the Asian flexible packaging market. The design of the dsX flex-pack 300S is a collaboration among Davis-Standard’s teams in the US, Germany and China to ensure pricing, machine footprint, speeds and output, and an ability to make shorter runs that accommodate demands of Asian converters. The Pawcatuck-headquartered firm says it plans to have its first dsX flex-pack 300S commissioned and customer tested by the first quarter of 2019. In addition, it will offer a tandem configuration of this machine called the dsX flexpack 300T for the Asian flexible packaging market. Another example of equipment for the Indonesian market is Davis-Standard’s new stretch film line equipped with the DS S3 winder. Quality control, versatility and efficiency are hallmarks of this technology, it says. The line features a compact machine arrangement, ease of servicing, excellent profile control, consistent roll quality and an intuitive control package. It is engineered for producing thin films from 7.8-13 microns at high speeds. Davis-Standard’s side-by-side DS S3 overlapping winder is essential to this capability. The DS S3 winder enables maximum slit widths for hand-wrap, machinewrap and jumbo rolls, supporting multiple market segments on one winder. Films discharge out the front of the line to a common side to simplify roll packing and future automation. Cores are also same-side loaded from the back to prevent disruption of packing activities. There is an auxiliary lay-on roll to eliminate top-wind waste during transfer, optimizing roll quality and eliminating outer wrap transfer waste. All features are advantageous for high-grade film operations. Meanwhile, Davis-Standard’s packaging equipment portfolio received a boost in June 2018 with the acquisition of compatriot Brampton Engineering, which has a large installed base throughout Asia. It benefits customers in terms of equipment technology and aftermarket services. This includes Davis- Standard’s ability to supply the multi-layer AeroFrost air-blown and AquaFrost water-quenched film systems, film winding and many other production solutions. Additionally, Davis-Standard’s regional presence at its subsidiary in China, Davis-Standard (Suzhou) Plastic Packaging Machinery Co. enables it to offer equipment and support. The Suzhou location offers a full complement of field service resources and spare parts, along with an R&D laboratory for customer trials. Indonesia’s heavy reliance on imported raw materials in the manufacture of plastics hinders the opportunities to further expand. Thus, investments in refineries to produce key ingredients for plastics will burrow into the industry’s vast potentials and eventually position Indonesia in the global supply chain. Major players are starting to make it happen. Stateowned petrochemical company Pertamina, joining forces with Thailand’s PTT Global Chemical (PTTGC), is expected to start up operations of the joint venture petrochemical complex, Indo Thai Trading (ITT), in Balongan, West Java, by 2020. It will produce 1 million tonnes/year of olefins, and has downstream facilities for the production PE, PP and MEG. The joint venture will be able to capture 30% market share target in Indonesia. 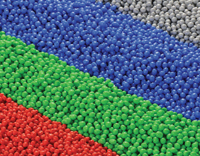 Thus, Kraiburg TPE, a Germany-headquartered TPE maker, is approaching the Indonesian market with its new thermoplastic elastomer (TPE) compounds for consumer and packaging applications at Indoplas. With TPEs advantages of recyclability, design flexibility, ease of processing and lower energy consumption, there is growing use of TPEs in consumer and packaging applications. TPEs enable stronger, safer, more durable packaging solutions, thus lending for better food storage and preservation. Kraiburg TPE’s new compounds in the FC/AD/PA THERMOLAST K series are aimed at manufacturers in the consumer and food industries. 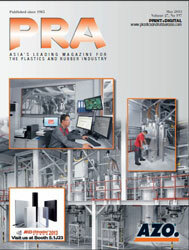 These materials have been developed specifically for food contact and feature excellent adhesion to polyamides (PAs). The natural-coloured compounds are available in hardness degrees ranging from 40 to 80 Shore A. They are not only characterised by easy processing and colourability, but also by high tensile strength and elongation at break. This makes the TPE family particularly suitable for a wide range of applications with direct food and mouth contact such as container and packaging seals, and parts of kitchen utensils and tableware. Other applications include sports items and cosmetics, as well as seals for hearing aids. “With our comprehensive materials expertise, sound knowledge of the market and consistently close customer relations, we are poised to capture a sizeable share of the consumer and packaging markets in Indonesia,” said Roland Ritter, Managing Director of Kraiburg TPE Asia. Along the same vein, Pertamina, partnering this time with Oman’s Overseas Oil and Gas (OOG), is slated to build a US$10 billion refinery at Bontang in East Kalimantan. The 300,000-barrels/day project, to be funded by the Oman government, is planned to start up in 2025, with Pertamina supplying 20% of the crude oil to be processed in the plant. Canada-headquartered Continental Energy Corporation, together with its 85%-owned subsidiary PT Continental Hilir Indonesia, has also established an Indonesian subsidiary, PT Kilang Kaltim Continental (KKC), under a foreign direct investment license. KKC’s crude oil refinery at the KIPI Maloy port and industrial park in East Kalimantan is expected to have a capacity of 24,000 barrels/day. The refinery is to be built in two phases, and is intended to produce diesel fuel, B30 biodiesel, LPG, naphtha, marine fuel oil, and residual fuel oil for local sale direct to industry, distributors, and consumers within the locale. The refinery’s US$50-million Phase 1 is targeted to start-up in December, and is scheduled for commissioning by end 2020; while Phase 2 will expand capacity by 18,000 barrels/day to 24,000 barrels/day as well as add complex equipment to enable production of gasoline and jet fuel. 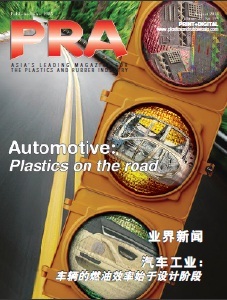 All of the above bodes well for the country’s growth in terms of plastics packaging and the automotive industry.